A highly decorated Special Forces soldier was identified by the U.S. Army as the soldier that was killed by an improvised explosive device in Afghanistan on Tuesday. Staff Sgt. Adam Thomas, 31, of Tacoma Park, Maryland died in Nangarhar Province from injuries caused by an improvised explosive device that exploded during dismounted operations. He was partnered with Afghan forces when he was killed, Pentagon spokesman Peter Cook said Wednesday. The incident remains under investigation. 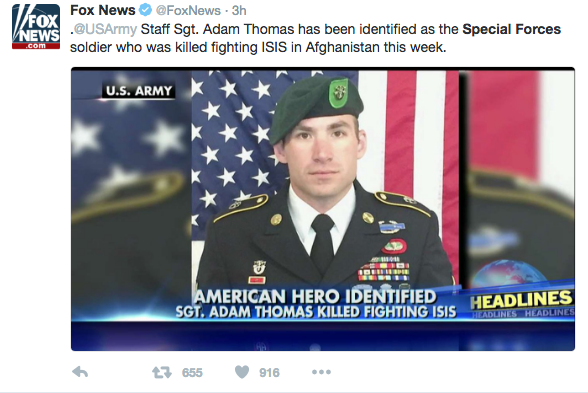 Thomas was assigned to Company B, 2nd Battalion, with the 10th Special Forces Group (Airborne) based at Fort Carson. He was stationed at Fort Carson since February. Thomas joined the Army in April 2008 and was supporting Operation Freedom’s Sentinel. He deployed to Iraq in December 2008 and did another two tours in Afghanistan. One tour was in 2011 and the other one in June. Thomas was the recipient of a Purple Heart, a Bronze Star, the Army Commendation medal, the National Defense Service Medal, Afghanistan Campaign Medal with Campaign Star, Iraq Campaign Medal with Campaign Star, Special Forces Tab, Ranger Tab, Combat Infantryman Badge, Expert Infantryman Badge, and Basic Military Free Fall Parachute Badge.